It's like a wedding out of an Elseworlds graphic novel: Superman and Harley Quinn decided to tie the knot in a (super) nerdy wedding. Here at The Escapist, we're big fans of nerd weddings (or, you know, amazingly geeky invitations). There was that retro game-themed wedding, the gamer geek wedding Down Under, and the one time when a bride and groom got all their guests to cosplay as super heroes. Now there's a new wedding to add to the list: The happy couple were such big comic fans that they themed the ceremony and reception around Superman and Harley Quinn. 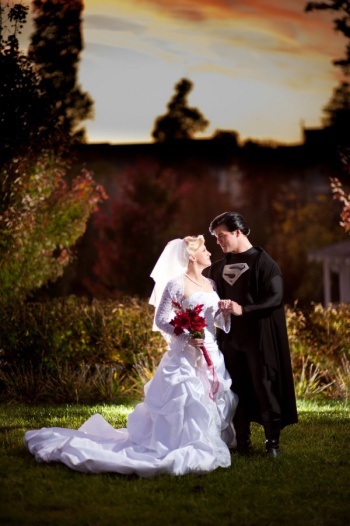 When Jessica and Jonathan Carroll recently got hitched, the groom and his friends were decked out in "the finest Krypton robes this side of the yellow sun." Though the bodysuits were store bought, and Jonathan managed actually made the robes himself. Meanwhile, the House of El crests were produced by Wildwood Studios (based on the design featured in Superman Returns). "My dress was not geek inspired per-say, as I wanted a traditional look, however my colors for the wedding were based on Harley Queen (red and black) and my bouquet was red flowers with white bounce pearls to represent the pompoms of Harley's collar and hat. My garter was superman colored with a small S logo on the bow. My engagement ring itself is based on the Harley Quinn diamond pattern, red rubies for the main diamonds and black diamonds around the edge." Not only that, but the wedding cake feature Superman and Harley toppers, while the groom's cake was designed to look like Clark Kent getting ready to make an appearance as the Man of Steel. You can see the photos from the event at the Facebook gallery by Bryan Humphrey, the wedding's photographer (who also took the photo shown here).